In face of the imminent deployment of the Ospreys [U.S. tiltrotor aircraft] from Iwakuni, where they are currently positioned, Okinawa is in the fireball-like opposition, with even some Okinawan representatives in Diet, prefectural or municipal offices participating in the all-out efforts by more than 100 citizens in the evening of blocking the gates of the U.S. Marines Futenma Air Station. 100 police officers were ineffective before 160 citizens, though some of the latter were brought away. People are determined to block those Ospreys being carried into Futenma Air Station. Those aged 65~75 are telling one another to gather at the gates, for they have less concerns than younger generations. Today, Shoichi Chibana, a famous Okinawan activist, who burned a Japanese national flag in late '80s, and has now become a Buddhist monk, came to my hometown for a talk. He said that it can be really said that Okinawa will do financially without the U.S. bases, considering the rise in the employment rate and in the revenue from tourism. I didn't know the population of Okinawa has grown to be slightly over 1.4 million. After his talk he received a phone call, letting him know that all the three gates of Futenma Air Station were successfully blocked by citizens with two lines of cars so that Ospreys would not be brought in.The current typhoon is giving Okinawans some time to rest from the struggles. But DOD doesn't seem to be aware that it has rubbed salt into Okinawans' unhealed wounds, especially hard this time. 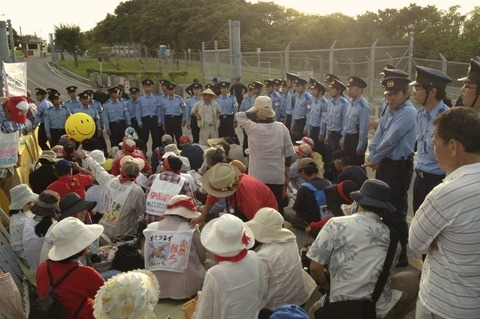 Now, from school children to the elderly in their 80s, Okinawans are determined to block the deployment at any cost. Kevin Maher [former director of the State Department's Office of Japan Affairs left his post following comments he made calling the people of Okinawa "lazy" and "masters of extortion."] has never understood Okinawans. DOD should know he hasn't. Veterans For Peace is calling for the grounding of Predator and Reaper Drones and for General Atomics to stop manufacturing them. Other members of VFP are currently traveling from the United States to Pakistan as part of a delegation organized by Code Pink to visit one area where U.S. drone strikes have become frequent. VFP is part of a coalition organizing an online petition in support of banning weaponized drones. If you're in Southern California on a Thursday, join the protest from 4:00 to 6:00 p.m. at the corner of Scripps Poway Parkway and General Atomics Way in Poway, CA. Mainer Regis Tremblay has been in Gangjeong village for the past couple of weeks filming the struggle against the Navy base. He returns home on Sunday and shared this farewell video with the villagers before leaving. Juan Manuel Sánchez Gordillo has become the face of the growing protest movement in Spain. The mayor of a small town in Southern Spain called Marinaleda, he has become well-known for leading combative protests and sit-ins, including a protest in a supermarket in which food was taken and redistributed to the poor. But Sánchez Gordillo has backed up his critiques of capitalism with a viable alternative. In his town of Marinaleda, there is full employment, people rent homes for 15 Euros a month, and everybody who works in the agricultural cooperative that was formed, including the mayor, earns the same salary. 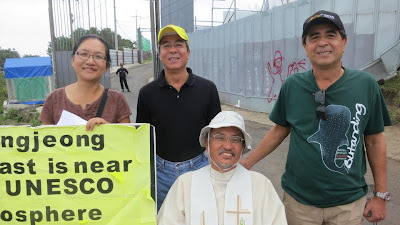 Antonio Claparlos (green shirt on right) was one of the strongest supporters of Gangjeong village during the World Conservation Congress held on Jeju Island earlier this month. Compared to the previous World Conservation Congress events held in the previous years, this most recent one from September 6 to 15, 2012 can be considered the most tiring I ever had. It was hosted by the Korean government and held in the island of Jeju, also known as the “Island of Peace”. Jeju is home of the Tamna people who have lived and sustained their natural heritage for thousands of years. Jeju has three myths of origin: that of the cosmos, of the island itself and of its human inhabitants. The latter a tale of three demigods who rose from Volcanic lava caves deep in the earth and married three princesses from another land, thus resulted in the Tamna Kingdom. The Sam-seong-hyeol myth (Lit: three name holes typically translated as caves of three clans) begin with the emergence of three male demigods by the names of Ko,Yang and Bu from deep caves and lava tubes in the surface of this volcanic island. Through the stability of agriculture and regional trade, the Tamna Kingdom was eventually formed. Ko became its first King with 45 Kings to follow. The Tamna Kingdom has been founded between the 3rd and 2nd centuries B.C.E. In 1105 C.E., the Tamna Kingdom subsumed as a province by the Goryeo Kingdom of what is now known as Korea. Jeju Island is seeking to become an environmental capital city of the world. A UNESCO World heritage site, its water is said to be“the purest in the world” — naturally-filtered by the volcanic rocks and its underground aquifers which retain 46 % percent of the rainfall, also making it Korea's most active aquifer. Its biodiversity is rich and the mystic of Mt. Halasan is a marvel on its own. There is much to be said about Jeju Island, its people and its natural heritage. More than 7,000 delegates from all over the world converged on this beautiful island to discuss the state of the planet and the way forward on how to save our dying planet. Even though this was the 5th World Conservation Congress we had attended, it was always nice to see old friends and meet new ones. I will always treasure these friends who share the advocacy with us all through the years. Despite the many years and meetings the planet seems to be getting worse. We have seen the planet evolve and yes, our planet remains in peril. Worse, it continues to be nearing the end of the line. As of this writing, a typhoon is heading straight for the Korean peninsula, sending a message to all that Nature has had enough! She can no longer sustain the pressures of the present development model. The same pressures put forth by continuous pollution, ocean-acidification and man-induced climate change. Atmospheric carbon dioxide is now almost 400 ppm. This is a very critical stage, enough to compel us to act on the need to reduce carbon dioxide to 350 ppm to sustain life. Yet, instead of being alarmed, the business-as-usual attitude even accelerated! There is no documented progress by the UNFCCC to mitigate CO2 and other greenhouse gasses. The many COP meetings has failed. The grassroots movement is increasing everywhere, taking matters into their on hands. They are even better armed with new initiatives like re-educating the masses about the benefits of solar cookers and renewable energy, also about mangrove reforestation. The movement is now pushing for a more active volunteerism spirit. The same drive is aimed for the protection of our forest and oceans. Radical changes are taking place as the establishment refuses to change. Yet, the Congress is tainted by the old consumption and production patterns which need to be changed. Corporate control of conservation is wreaking havoc on the mission and vision of the conservation movement and the World Congress. What does this picture out to the world? A scary scenario, that of an increasing poverty. Peak of oil and food and peak of everything is in the making. More Arab springs are already taking place. The people are suffering from many austerity measures imposed on them by the IMF and their respective government. Unknown to many, there is talk of another stimulus for the economy which will only cause more inflation. It is foreseen to make life harder for the seven billion people of this planet of which over 2 billion live below the poverty line. Food shortages and the destruction of our biodiversity has made the battle for resources inevitable. Gangjeong Village is the site of the construction of a naval base. The motion is sponsored by the Center of Humans and Nature and co-sponsored by over 32 non-governmental organizations. They all exerted efforts to have the said motion adopted. The motion was voted in plenary this morning, after many contact group meetings and heated debates were conducted. We are honored to be one of the co-sponsors. The motion was not adopted by the Congress since it needed both houses of government and NGOs. However, the government house had more abstentions. It had more “yes” votes than the “ no” votes and the NGO house had the majority. This sent a strong signal to IUCN and the world that Gangjeong village and its people and Jeju Island must be protected. It has given hope to the villagers to continue to fight for their natural heritage which they have nurtured sustainably for centuries. The message of the congress is clear: We must save the villagers of Gangjeong, Jeju Island . We must protect the people and planet. Otherwise, all these congresses and meetings are meaningless and a waste of time. The World Conservation Congress ended with a declaration that I can best describe as the biblical cymbal – making all noise yet signifying nothing, all empty words. Real and concrete action on the ground is what is needed. 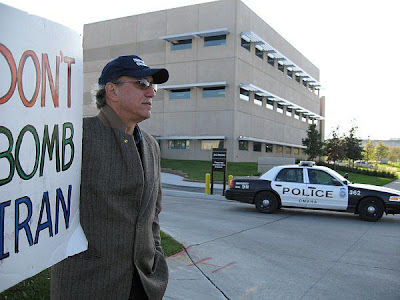 Israel lobbyist and deputy director for research at the Washington Institute for Near East Policy (WINEP), Patrick Clawson, suggests that a false flag attack is almost certainly needed to go to war with Iran, as initiation crisis has always depended on some kind of a single event, in many cases a false flag to justify the waging of war. WINEP is a spin-off of the American Israel Public Affairs Committee (AIPAC). The statement was made at the Washington Institute for Near East Policy in response to a question related to America's options in case negotiations with Iran fail. Disturbing, powerful and emotionally devastating, Tears of Gaza is less a conventional documentary than a record – presented with minimal gloss – of the 2008 to 2009 bombing of Gaza by the Israeli military. Photographed by several Palestinian cameramen both during and after the offensive, this powerful film by director Vibeke Løkkeberg focuses on the impact of the attacks on the civilian population. Tears of Gaza makes no overriding speeches or analyses. The situation leading up to the incursion is never mentioned. Similar events certainly occurred in Dresden, Tokyo, Baghdad and Sarajevo, but of course Gaza isn’t those places. This is the Navy's new super-rigged Zumwalt destroyer being built at Bath Iron Works (BIW) in Maine. The Associated Press reported in June that “A super-stealthy destroyer that could underpin the U.S. Navy’s China strategy will be able to sneak up on coastlines virtually undetected and pound targets with electromagnetic ‘rail guns’ right out of a sci-fi movie. (Using electric pulses, not chemical explosives, the ‘rail gun’ can shoot a 40-pound metal slug from New York to Philadelphia at up to 5,600 mph — more than seven times the speed of sound — with 32 times the force of a car traveling at 100 miles per hour.)" The new stealthy DDG-1000 being built by General Dynamics in Bath, Maine will cost between $4-7 billion each. The Navy did not actually want the destroyer because it would eat up too much of their shipbuilding budget. But the Obama administration, which was strongly supported in his run for president in 2008 by the Chicago-based Crown family (which are majority stockholders in General Dynamics), has insisted the ships be built. Previous versions of Navy destroyers, outfitted with ‘missile defense’ systems cost about $1.5 billion each. See military promo video about the warship below. Last February the Washington Post reported that "77 percent of liberal Democrats endorse the use of drones, meaning that Obama is unlikely to suffer any political consequences as a result of his policy in this election year." If Bush or Romney were now president I can promise you that 77% of liberal Democrats would be howling against their use of drones. Welcome to party politics in the USA! Obama has signed a deal to keep the U.S. and NATO forces in Afghanistan up to 2024. They need to have an enemy to justify spending $2 billion a week on this insane project. By killing innocent civilians in Afghanistan and neighboring Pakistan with drones the U.S. ensures that a steady stream of "enemies" are created. I'd call that evil. The first day of the UN General Assembly in New York was quite predictably marked by a boiling over of tension between Iran and Israel. Iranian President Mahmoud Ahmadinejad used his speech at the gathering to denounce Israel's alleged nuclear stockpiles and its occupation of Palestine. The Iranian president's address to leaders and ministers from over 100 countries prompted Israel's ambassador to walk out. Ahmadinejad also implicitly accused the US of shielding Israel and paving the way for a strike on Tehran. This comes just days after Washington decided to remove an Iranian militant group, the MEK off its terror blacklist. Jamal Abdi, the Policy Director of the National Iranian American Council, believes the sudden change of heart over an organization striving to overthrow the Iranian regime, is no coincidence. I can't stand the utter hypocrisy coming from the U.S. and its allies about Iran having a nuclear weapon. Israel has hundreds of them as do several other NATO lap dogs. 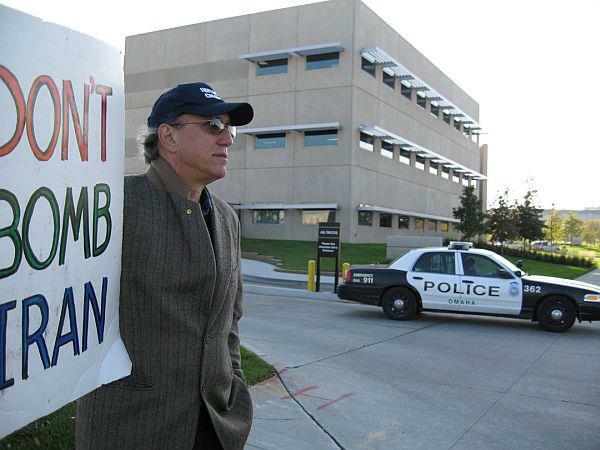 The U.S. reeks of nuclearism. We can't let another war get started. Stand up now while you still have legs! 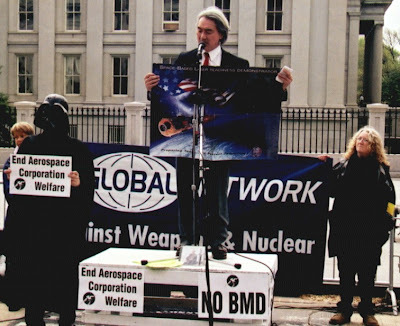 Dr. Michio Kaku speaking at the Global Network protest in front of the Treasury Department in Washington about the cost of Star Wars. 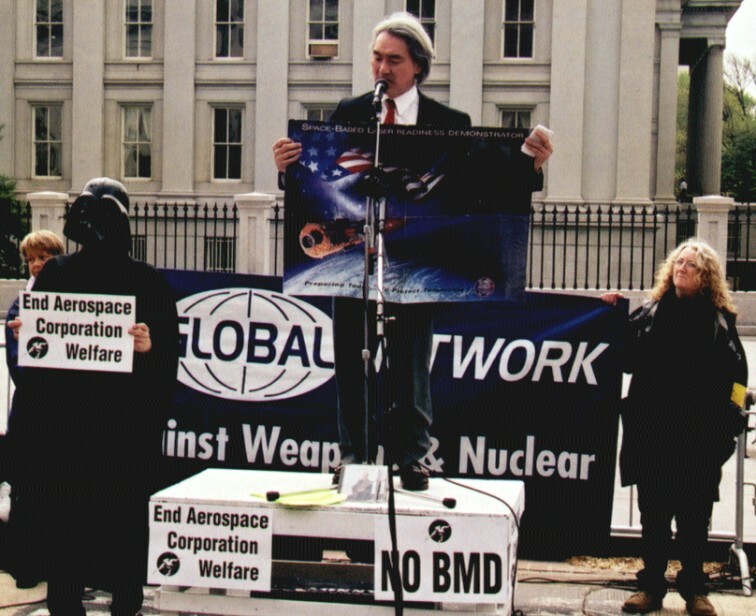 The protest kicked off the GN's annual conference in 2000. Keep Space for Peace Week is co-sponsored by the Women’s International League for Peace & Freedom, Campaign for Nuclear Disarmament (UK), Swedish Peace Council, and the Drone Campaign Network (UK). I was at the Common Ground Country Fair from early Friday morning til Sunday afternoon. 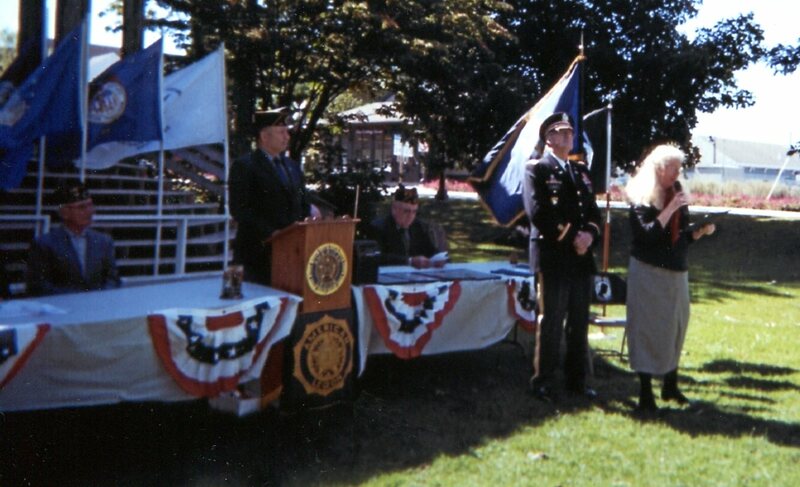 I was working at the combined tables of Veterans for Peace and our Maine Campaign to Bring Our War $$ Home. About 60,000 people passed through the fair throughout the weekend. 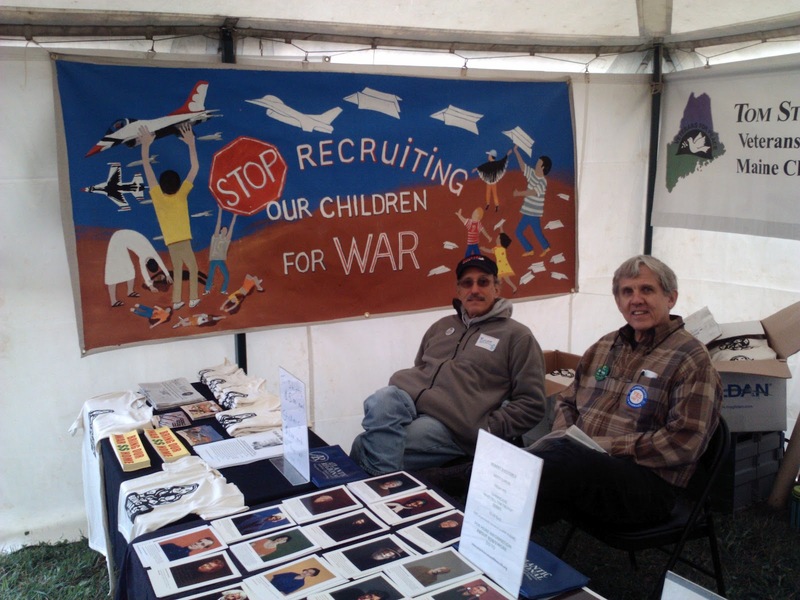 Not all of them stopped by the big political action tents but many of them did. We sold more than $300 worth of our T-shirts and bumperstickers. Got to talk to alot of people. We priced the T-shirts to sell at $5 each, just trying to recoup our costs and wanting to get the message out far and wide. In this photo I was joined by Mark Roman who is a fellow leader of the Bring Our War $$ Home team. I slept (if you can call it that) in my leaky tent on Friday night through the rain. On Saturday night I put the back seat down in our tiny car and slept in the fetal position. My back paid for it but at least I was dry and actually slept pretty well considering the circumstances. The food at the fair is all organic Maine grown (and very good) but increasingly expensive as the many vendors act as good capitalists and charge what the market will bear. But paying $9 or $10 for a sandwich rubs me the wrong way. We need some price controls at the Common Ground Fair! Otherwise it is a great event. I spent some break time yesterday watching the cows and oxen dragging logs around and then my favorite sheep herding dogs moving sheep, goats, and ducks into pens. Always fun to watch them. Our booth was near the Obama for president table so we had some interchanges with a few liberal Democrats during the weekend. One of them talked about the need to have bombed Hiroshima and Nagasaki to end WW II. I've become increasingly frustrated trying to reason with these loyal Dems who close their minds and hearts to the war machine when their party takes the White House. I saw it when Clinton was president and we see the same phenomena with Obama in office. But if a Republican gets back into the White House many of these Dems mysteriously again transform into peaceniks. Have to start calling them shape shifters I guess. On Saturday at the fair was a dedication of a tree in memory of much loved VFP founding member Tom Sturtevant who passed away last winter. His children donated Tom's 70 year old bass drum to our chapter and you see in this video his son-in-law pounding it during the playing of Tom's favorite song - When the Saints Come Marching In. A nice group turned up for the tree dedication. “Thank you, Chick for your invitation and thank you to the organizers of this event to honor veterans. Thank you all who are here today. I ACCEPT this certificate and memorial coin on behalf of myself a Vietnam Era Veteran and my spouse Peter Caron a Gulf War era veteran and my brother Bob a Vietnam Vet who returned home and killed himself. I accept it on behalf of all veterans and their families who have suffered from the suicide of a veteran. A veteran commits suicide at the rate of one per day. Today’s recognition of veterans is only a beginning—let’s take care of those who come home—when they come home seemingly whole but broken. Many are broken owing to guilt from things done during war that should never be done in wars that should never be waged. We send people to war to do what we would not and then fail to care for them. Every returning war veteran should be screened and cared for to prevent suicide. Yet, the best care for the vet will be to remove our United States from senseless wars done in the name of corporate interests and not in the name of defense. Let’s take care of those who take care of us. Dedicated peace activist Kathy Kelly (Voices for Creative Non-Violence) on my This Issue public access TV show.